I called in to book an appointment for a dry trim (not more than 3 inches off all around) I have a simple shape no layers and was asking probably one of the most basic trims. I asked how much it would be and was quoted £56.00 I was astonished and had to tell them I'd leave it!! Had my colour and cut done today by Natalia and Emily, my hair was quite badly damaged through over bleaching, Natalia went to great lengths to put right and talked through all options, Emily is clearly an accomplished cutting technician, i now have a very sleek Bob and a beautiful colour by Natalia to set it off, great atmosphere, very very happy!! went today expecting a really good hairstyle, sat with stylist ***** explained to the best of my ability, my hair was a chin length bob slightly grown out as I had been on holiday I Did explain I wanted some layers put in to give it some lift. yes she did put layers in and I ended up with a sausage roll around the bottom of my hair (no layers in this bit) I asked for a fringe to be curved again this did not happen, so annoyed and also at a cost of £55 I did not get what I asked for. this person I was told was a top flight stylist. When I booked by phone I did say I wanted a mask conditioner and to discuss my colour, non of this happened. another case of do what they want and get you out of the salon. an expensive experience one I will not have again. WOULD NOT RECOMMEND. Extremely disappointing customer service for a Liverpool City Centre Salon. My mum had booked an appointment today for a wash cut and blow dry for £39. Having had her hair cut here before, she was looking forward to another great restyle. After being seated at the hair wash basin she was informed that due to ongoing boiler problems the water might be “a little bit cold.” When the water was switched on it was VERY cold, no warmth, just standard cold tap water that NO ONE would use to wash and condition their hair. My mum found the temperature unbearable and advised that she felt unable to proceed with the wash or even have the rest of her hair wet down. It was agreed with the stylist that they would use a spray bottle to dampen the hair for the cut. For what it’s worth, my mum was happy with the cut and feels the stylist did the best she could in the circumstances but it was the managers attitude which left her feeling more than a little disappointed. The stylist took no more than 10mins to dry Mums hair as it was only damp from the spray and she would be going home to give it the wash it needed when she arrived for her appointment. Without any complaint from my Mum the stylist had a discussion with the person in charge that day and returned to advise that because the water was cold they were giving her £5 off. ? As you can imagine this is hardly acceptable given the grave differences between the service offered and the service received. The salon manager was contacted by phone and was less than helpful. She very reluctant to drop the price to an acceptable one and was in no way apologetic for the lack of a “service” my mum received. I sincerely hope other customers had the fortitude to complain about paying the price of a wash cut and blow dry for what was effectively a dry trim. Poor form Rush. I called the day before and the ever flexible team managed to squeeze me in for an appointment. Even on a busy, bustling Saturday Natalia always manages to take time out for a thorough consultation to make sure she understands what you want. Staff are all nice and friendly which makes up for the not so good cut. (I have short hair and level of expertise is very visual) After the prise raise forget it. Went to this salon on my birthday for a simple cut blow dry with pin curls, I sat for half an hour before my hair was even washed. Then when I was finally seen they took 3 hours to do my hair, this was due to the first stylist not being able to do the pin curls correctly and another member of staff having to correct it. When I brought this issue up to the manager she took £10 off my bill, HOWEVER...when I was next doing my own hair I realised she had cut a chunk of my hair to only a couple of inches short. I have long hair and no layers, will not be going back or recommending to anyone!! Nice salon and staff are very friendly, but dreary me they are so very slow. I waited for 45 minutes whilst my colour was mixed, saw another lady who sat waiting to be seen to and she got up and left after 30 minutes which inspired me to do the same. I had travelled an hour and half and was prompt for my appointment, but didn't want to be there all day. The lady who was 'mixing my colour' I think had left the building, maybe to grab some lunch, but she was certainly no where to be seen cos I looked, I even went out the back. Shame the service is so slow as otherwise a decent salon. I won't be returning. I walked in today without an appointment with horrible dry badly streaked hair. I am originally dark brown,but to blend in the grey had a build up of blonder highlights that had gone brassy. I came out having trusted their expertise feeling brilliant. I have an overall effect of a more natural darker shade, but the gentle highlights throughout have prevented it looking harsh and ageing. Will go back everytime I visit Liverpool to see my parents. 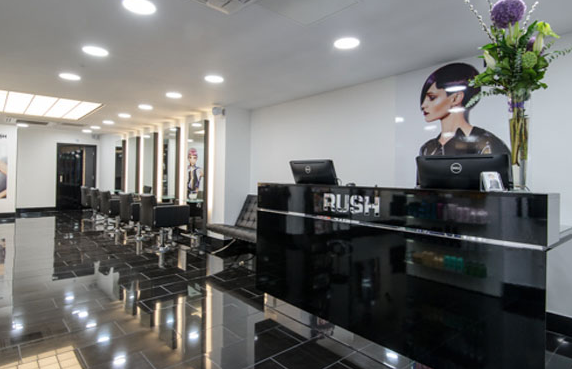 Rush in Liverpool is a very welcoming salon! The staff immediately asked if I wanted a drink and it arrived in a lovely silver espresso pot! I had the pamper package and on my first visit met Beth who was great! She knew my hair type immediately and I was very impressed with the cut which is very easy to do at home! She gave me lots of tips to help with the volume. I had my 2nd visit today which was for a gloss colour. I had the same excellent service! Molly gave me a fab head massage and Beth put on a beautiful colour! I am very impressed with the service at Rush and would highly recommend a visit!